Hey, y'all! I cannot believe we are into the second week of December. I'm not sure why I'm caught unprepared every year. We celebrate Thanksgiving, and then it should be the start of the Christmas season. And yet, I find myself mid-December-ish all flustered. Like I had no idea it was almost Christmas. Oy! At least I've got the tree with lights on (no decorations yet) and I've ordered my holiday cards (which I didn't even bother to send out last year). 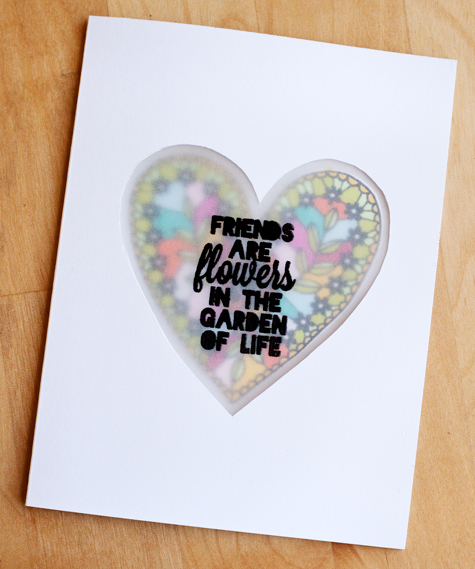 Meanwhile, over at Lawn Fawn, we are debuting our Valentine's Day stamps, dies, and inks. Yup. 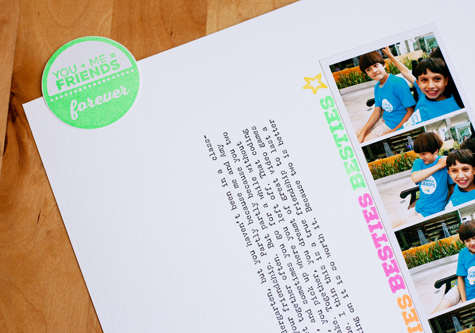 You know, the usual: super cute stamps and really awesome ink colors. I made this first layout with the new XOXO die. This layout couldn't be any simpler. Every time I try to take a photo of my three boys, they make crazy faces until I break down and get fake-angry. But I usually just keep shooting (crazy faces and all) because I never know when I might get a good shot. Put them all together, and I get a cute photobooth effect. 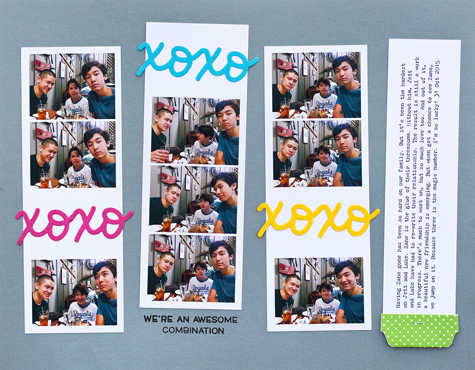 I cut the XOXO out of various cardstock to add a few dabs of color. 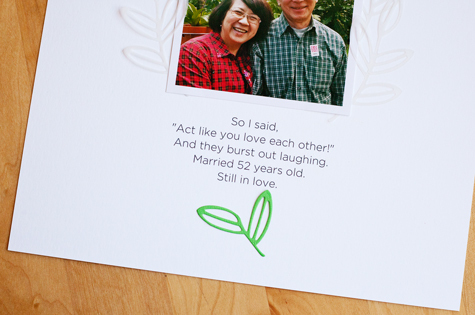 The sentiment is from the new Pizza My Heart set. 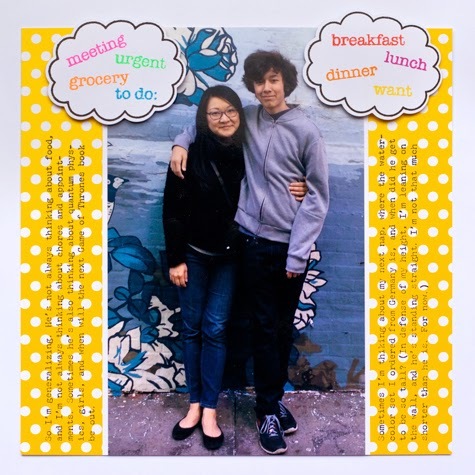 For this layout (8" x 8"), I used A Birdie Told Me stamps and dies to create those speech bubbles. Typed my stats in each, and stamped the little hearts (from Pizza My Heart) using the new and awesome Plastic Flamingo ink. The I Love You title is from the new die, and I created the ombré effect with the same ink. Love pink on red! By the way, I just recently got a metal shim to use in my Cuttlebug. The awesome Teri Anderson told me about it when I was kvetching about how hard it is to get a good cut out of a detailed die. I got one and it's like magic! Really! Teri, you are a genius! All the new stamps/dies/inks will be available on Lawn Fawn's site (and probably everywhere else) starting on December 10. But you could win them first, by going to the blog and leaving comments! Hope you are having a great holiday season! Thanks for coming by. Hi friends! Can you believe Thanksgiving is almost here? Yikes. Time has flown by. This year more than others for me. Over at the Lawn Fawn blog, we are celebrating Fawny Holiday Week. 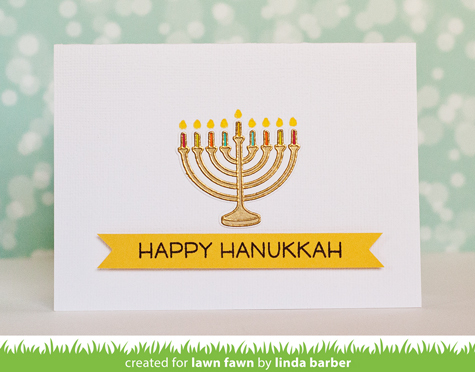 The design team has gotten together with the folks at the Lawn Fawn headquarters and our friends from Lawnscaping to create lots of holiday projects. 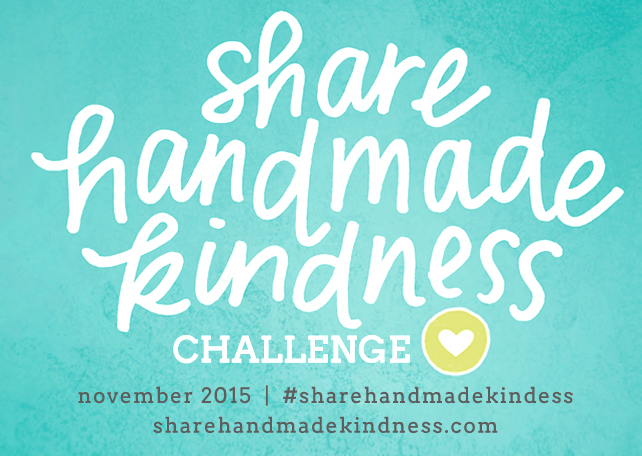 We are hoping to inspire you to create some handmade kindness to share this holiday season (more on that below). I've never made cards in bulk before. But inspired by Jennifer McGuire's Share Handmade Kindness project, I agreed to create lots and lots of cards for my Littlest's elementary school fundraiser. Things I've learned: 1. keep it simple; 2. get a Misti, which sadly I didn't have. But I'm working on that. And I have to say that I truly enjoyed making all those cards. There's something about creating multiples of the same thing. I made Christmas cards and Hanukkah cards. Both simple and super easy to recreate. The cards themselves were just blank prefolded ones from American Crafts (envies too), and the cello baggies were the ones holding the AC blank cards. I recycled them. Let's make it easy on ourselves, people! While that looks like a long list of supplies, the real key is to use whatever you have! 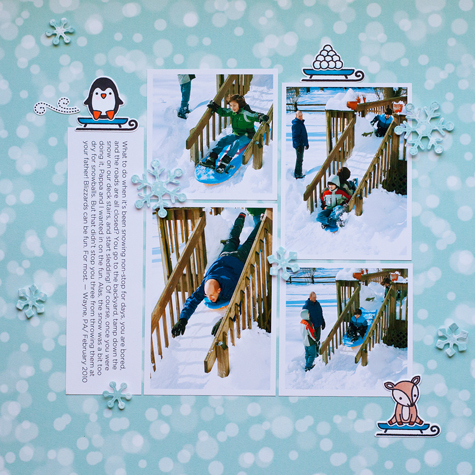 Do drop by Lawn Fawn's blog to see many more holiday projects and enter for a chance to win some stamps. And now, Share Handmade Kindness. If you follow me or other stamping/cardmaking folks on Instagram, you've probably seen Jennifer McGuire's amazing challenge. One of the (many!) things that makes Jen an amazing person is that she's so kind and generous. She's a "what can I do for you" person, and NOT a "what can you do for me". That is so incredibly rare these days. We, crafters, are prolific makers of the good stuff! But I hardly use any of the cards I make. The idea is to put these creations to use. You know how amazing it is to receive snail mail. And if you get a handmade card? Even better. So please go by her blog, check out the challenges, and share more of what you create. Hi there! This week, Lawn Fawn is partnering with Chameleon Pens to bring you some fun projects. Chameleon Pens are alcohol markers, but totally unlike anything else in the market. Instead of many pens of the same color in varying tones, each Chameleon pen uses a toning medium to create variety. That means a lot less pens to store. Caveat, you'll need lots of practice! I know I'll need a lot more practice. Luckily, practicing coloring falls under the "fun" category. There are lots of videos and tips on the Chameleon blog. 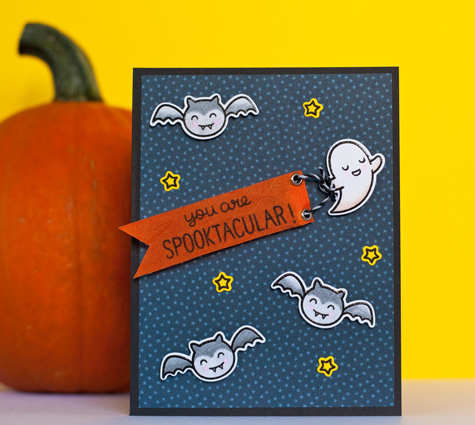 For this card, I used the Spooktacular stamps and dies, Beachside Petite Pack, Black Tie Lawn Trimmings, Black Licorice ink pad, and the Chameleon Pens Pastel Tones Set. I made the banner with some orange ribbon and eyelets. I haven't used eyelets in so long! I even broke out the Crop-a-dile. Ha! Thanks for dropping by! Hope to see you again soon. Hey friends! Lawn Fawn's October Inspiration Week is drawing to a close soon! This month's theme is winter/holidays. 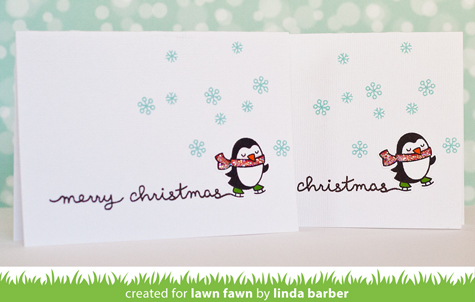 And Lawn Fawn has so many new super adorable stamp sets. I created two layouts for this week. 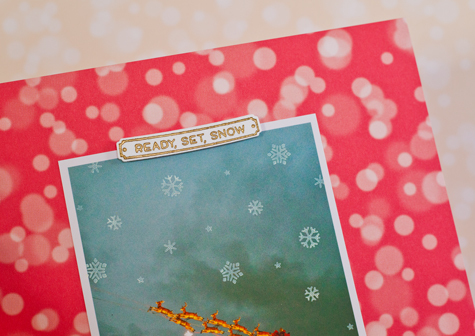 This first one uses Red, Set, Snow stamps, the matching dies, Lawn Trimmings, Let's Bokeh In The Snow papers, gold embossing powder, and my most favorite white ink! I've always loved snow. It requires very specific conditions to happen. And while it happens regularly in some places, it always feels magical to me. I remember the first time I saw snow falling. I was mesmerized. I was also at work, and spent a good 15 minutes staring out the window until my co-workers called me on it. Nothing like peer shaming... Sigh. But anyway, now that I live in the land of eternal sunshine, I really really miss snow. I miss staying in with the kids and getting all cozy with our hot chocolates and a movie. I miss going out and playing in it. I miss shoveling. Yes, shoveling! I miss it a lot. 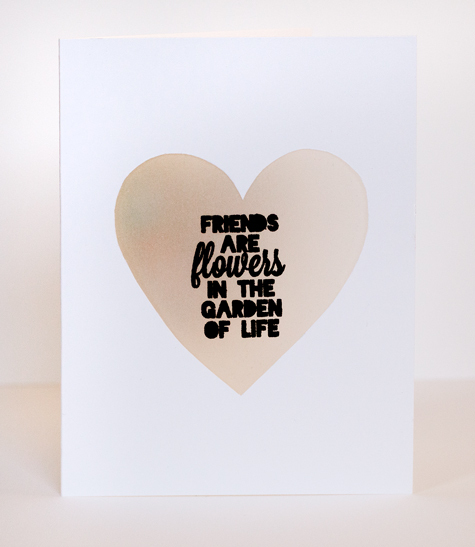 Let's also talk a little about this white ink created by Lawn Fawn. It's called Yeti (insert heart icon x 2.) It's a pigment ink, so you can stamp on dark surfaces and it shows. It's honestly the best one out there. And I know, because I've tried them all. 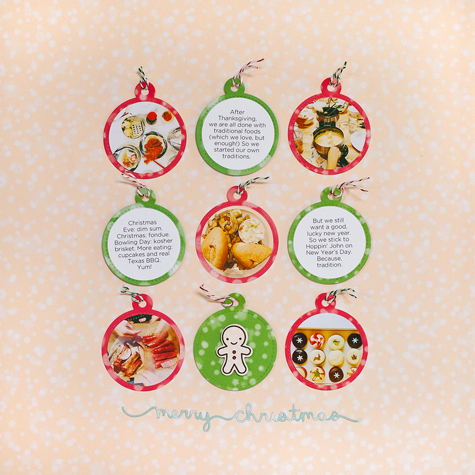 This layout uses Let's Bokeh In The Snow papers, Lawn Trimmings, Merry Christmas and Stitched Circle Tags dies. The little gingerbread person is from the Oh Snap. Cutest stamp set this release! Thanks so much for coming by. 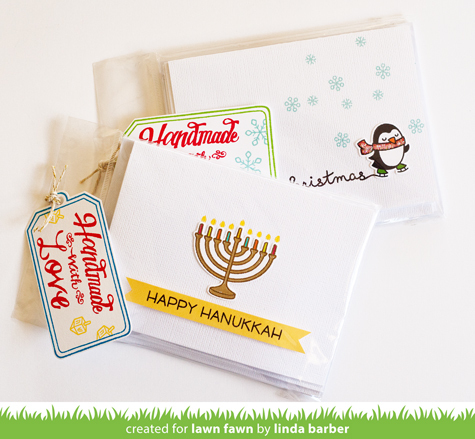 And don't forget to drop by Lawn Fawn's blog and leave comments to win the new goodies! See you again soon. TGIF! I'm super excited about this weekend. I'm off to Philly see some old friends. It's so good to catch up with people who know your history. I took the photos with my iPhone and put them into a strip using Photoshop. The stamps are from Technique Tuesday's Besties set. The inks are Colorbox's Pigment. The stamped circle can be easily punched out using a 1.75" punch, or one of these Circle dies. Because hand-cutting circles? Not for the faint-hearted. Meaning, ME! Thanks for dropping by. Hope you have a great weekend! Happy Tuesday! It's almost October, so the whole of the North Hemisphere is probably back in school now. My kids went back since August 11. Totally insane. 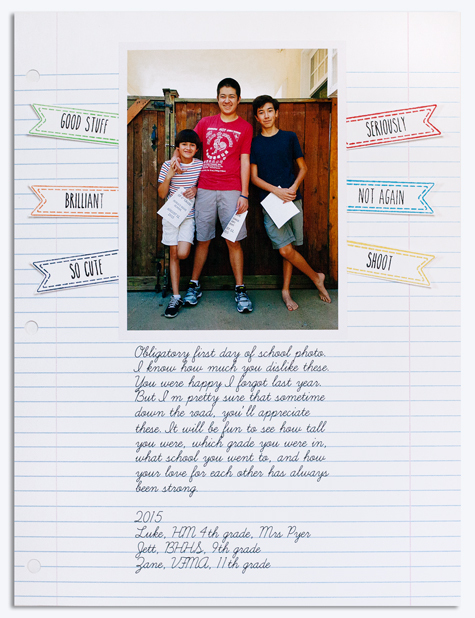 Since my three boys started going to three different schools, back to school photos were a bit different this year. Last year, I forgot to take them altogether. It was my first time not taking those first day photos since my oldest started preschool 14 years ago. It still bums me out, but what can do... This year, I remembered right as they got home. Phew. So there are no backpack photos, and Middlest is not even wearing shoes. But I'm okay with that. These photos are a measure of the passage of time for me. Maybe when they are all in college, I'll make a book from all the photos (except 2014, sigh.) It will be so awesome to see them going from little to giant (the oldest two are way taller than me), from babies to men. Those stamps are also perfect for planners. I used to use planners (like back in the dinosaur age) and I really want to get back into using them, but I can't quit the phone reminders. Sniff. Planners are so pretty! Hope you are having a good week and way better weather than me! It's still in the mid-90s here. Blergh. Hey friend! Happy Wednesday! My kids have the day off. Which I love! Even if we don't do anything special, it's always nice to just hang out with the boys. It's also the last day of Lawn Fawn's September Inspiration Week. If you have never checked one out, you have to. Lots of projects/ideas/prizes. I created a couple of layouts for this fun week. 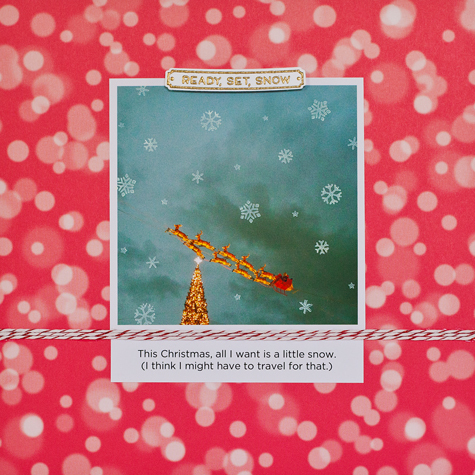 The first using a combination of the Let's Bokeh In The Snow papers, Toboggan Together stamps and dies and Stitched Snowflakes dies. These are probably the last snow-filled photos I have. Unless we decide to go chasing snow this year. Which never happens because we are beach people. I'm possibly the worst skier. Ever. 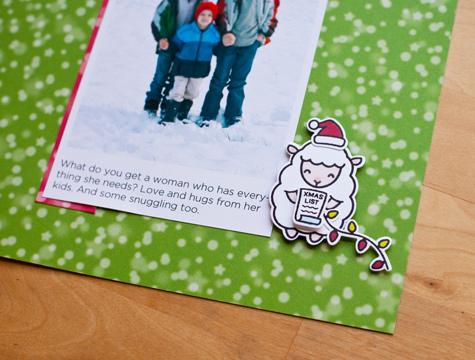 This next layout uses more Let's Bokeh papers, and the super cute Baaah Humbug stamps and dies. 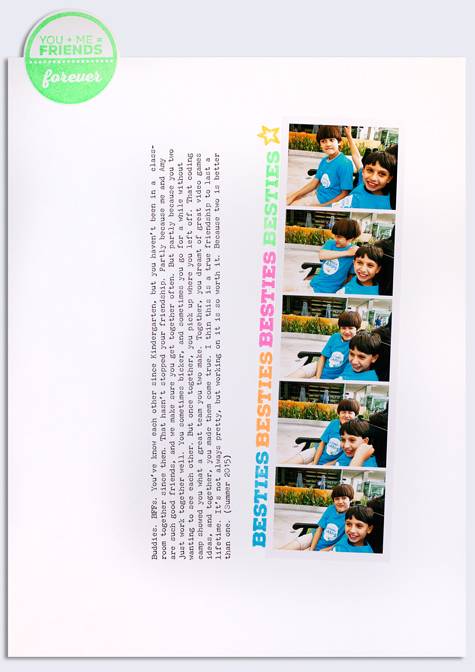 And photos of my boys when they were much smaller. Like shorter than me. Sniff. Sad news: some of these stamps are already sold out. Great news: you can head over to the Lawn Fawn blog and leave comments for chances to win. Yay! Edited: Yikes! My comments section was not working. Sorry about that. Fixed! Thank you Elizabeth Dillow! Hey, y'all! After much summer hibernation, I'm back! And for a great reason. 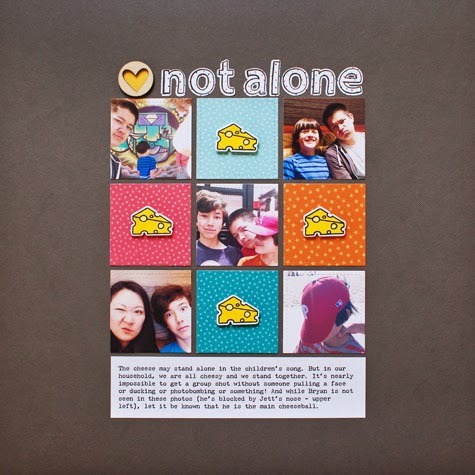 Today is the blog hop for Cath Edvalson's amazing stamp and die designs for Technique Tuesday. You are probably arriving from Lisa Adametz's blog. Welcome welcome! If you don't know who Cath is, you'll arrive at her blog at the end of this hop. Or really, you should go there immediately. And then come back to the hop. She's that awesome. And to top it off, she's a super nice person. Win-win. I love this Instagram I took of my parents. They are so cute together. I used Garden Leaves Die set to cut those vellum leaves. Then I cut one out of green cardstock and trimmed off the lower two leaves for that little detail. I love that the focus is on the photo and story. But that bit of leaves and green pick up the background of photo (Huntington Gardens). 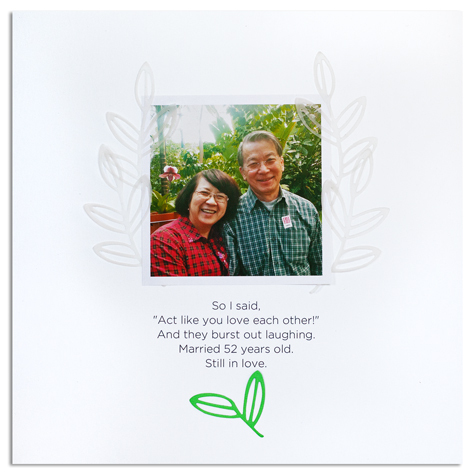 For this card, I used two sets of stamps, Heartfelt Thanks and Garden of Life. 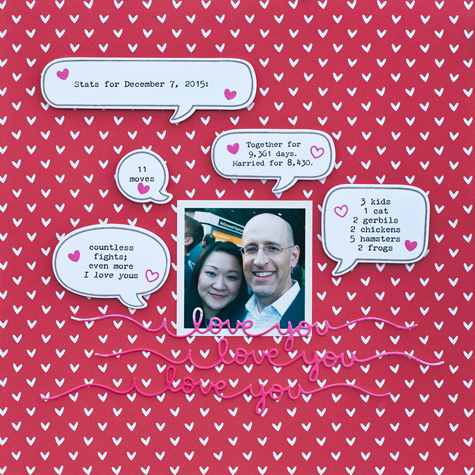 I cut out a heart slightly larger than the Heartfelt heart stamp on the top flap of the card base. Then I stamped the sentiment from Garden onto a piece of vellum and embossed it with black powder. 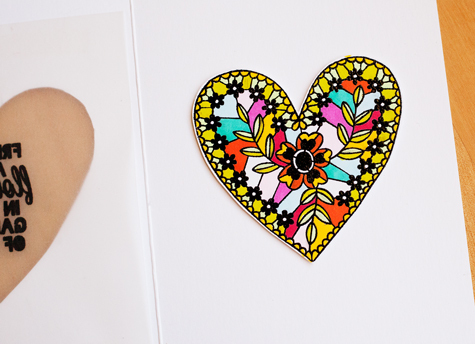 I stamped the heart on another piece of cardstock, embossed that and colored it in with markers. Not the fastest card, but super easy! Just what I like. By the way, black embossing powder? Messy! So now what? Well, you are almost at the end of the hop. Next up is my dear friend Teri Anderson's blog. And then, PRIZES! Technique Tuesday is giving away 3 prizes. One person will win all of Cath's new products. Two people will win $25 gift certificates to get whatever they want from the Technique Tuesday store. For chances to win, leave comments along the blog hop. The winners will be chosen randomly from all the comments from all the blogs. So leave a comment at each stop for more chances of winning. Easy peasy! You have until September 16, 2105, Midnight PST to leave comments. The winners will be announced September 18 on the Technique Tuesday blog. Thanks so much for coming by! I'll be resuming my blogging again soon. Since I'm such a slacker blogger, I end up with projects that I forget to share. Oops. 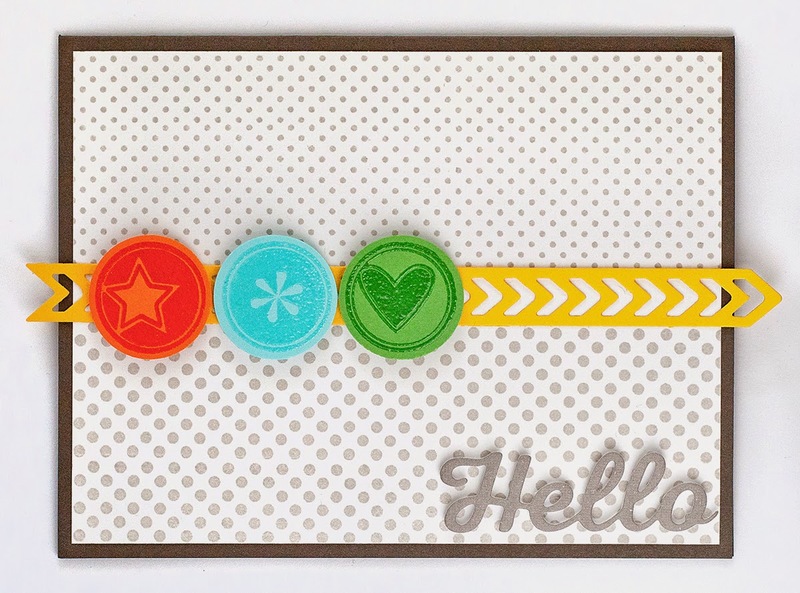 This is a layout using Your Everyday Stamps Planner set. Alas, my dear friend Ashley has had to close her stamp shop. Here's to hoping it will reopen again soon! This one was created for Lawn Fawn. I used the Best Pun Ever stamps and dies, Quinn's ABCs stamps and dies, Hearts wood veneer, and Pint-Sized: Beachside petite paper pack. 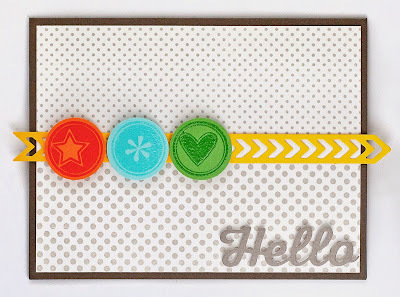 And lastly, a card created for PageMaps using Technique Tuesday's Here and Now Flair stamps, Happy Day Flair stamps, Lots of Dots stamps, Hello Pocket die, and Chevron Strip die. You can see what the TT design team created here. I think I'm caught up. I think. Hey there! I hope you've been visiting the Lawn Fawn blog and checking out the latest Inspiration Week. 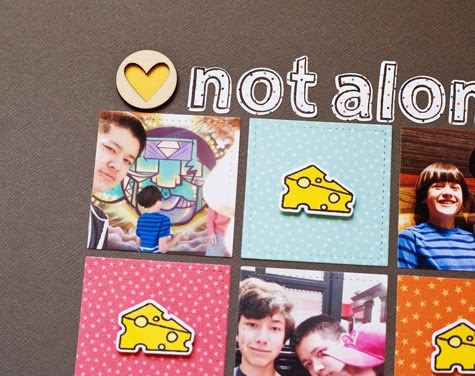 There are so many great projects, new products, and lots of giveaways! Giveaways! 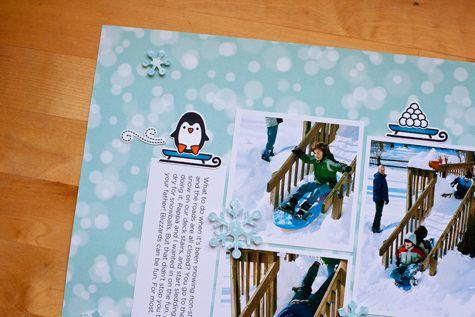 In this layout, I used the So Jelly stamps and dies, and the Stitched Borders dies, as well as the Pint-Sized Patterns: Beachside Collection and the Let's Polka, Mon Amie paper collection. 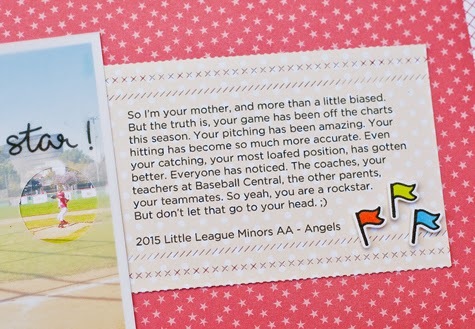 Since the photo is fairly small (Instagram), I wanted to make sure we knew that my kid is the pitcher. So I cut a piece of vellum the same size as the photo, punched out a circle, and used it to highlight my child. I stamped the sentiment directly onto the vellum. Give the ink lots of time to dry (or you can heat emboss it). 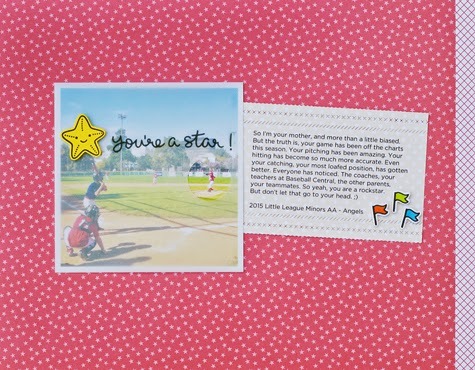 The starfish was stamped onto yellow cardstock and cut out using the matching die. 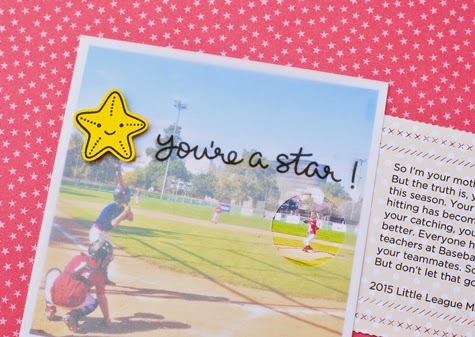 That cool border around the journaling is made using the new Stitched Borders. I just kept them together, ran them through my diecut machine (Cuttlebug), then I tore a small piece of the patterned paper off each end. I love the results so much (as in, brace yourself, because I'll be doing that again and again...) The little flags are from Party Animal set.